As President Obama takes a tour to India, lots of opportunistic commentators are making the comment that this is proof that the USA is a friend to India and, therefore, a false ally for Pakistan. The proof in the pudding for these people is that Obama made some remarks about how extremists are still in Pakistan. But this idea that the US cannot be friendly with both India and Pakistan is based on a misdirected mindset that defines Pakistan’s geo-strategic importance only in negatives. We must change this. The rivalry with neighboring India is deeply rooted in mistrust based on previous acts of aggression, but our defining ourselves in the world community – particularly with the US – as an ‘anti-India’ is based in cold war politics that are no longer relevant. When India decided to take a ‘non-aligned’ stance with regard to the US-Soviet Cold War, there was an opening for Pakistan to become the regional ally of the US side. But this was a weak entrance to forming a lasting partnership with the superpower. Certainly we provided some security to the Americans during the Cold War era, but India was never really on the verge of being a Soviet satellite. We provided an important avenue for the Americans to fight the Soviets in Afghanistan using jihadi proxies, but even this only brought short-term benefits. By the time the Cold War ended, these reasons for being a close ally of the Americans had expired. After 9/11, we were able to revive some of this same geo-strategic rationale to renew aid from the US – now as a partner in the fight against Taliban instead of Soviets. But this is still a negative. This is why you see many hard line commentators saying that we have to abandon our reliance on US aid and turn to other regional partners like China because eventually the Americans will have to leave Afghanistan (either winning or losing) and then where will we be? We should be working to make agreements with all nations – especially those like China with whom we share borders. But we should also be working to establish closer partnerships with superpowers like the US and EU based on positives, not negatives. This nation is not only good for serving as a security checkpoint – we need to look beyond military and security agreements and concentrate more effort on trade and natural resources. There has been some controversy recently over a contract for foreign companies to work the copper and gold mines of Reko Diq. A controversial article by Shaheen Sehbai (Jang Group) has suggested that there is some conspiracy to defraud the nation of its potential wealth by ‘giving away’ the natural resources. Shaheen Sehbai says that we should be more like Venezuela when negotiating mining contracts to make sure we maximize our benefits. But this shows just how little Sehbai knows. Venezuelan President Hugo Chavez’s nationalization schemes have actually hurt the long term prospects of their economy. EDC said the Venezuelan’s leader’s “willingness to expropriate businesses and breach contracts is a significant worry for both domestic and foreign-owned businesses.” It said, “Private business is under constant threat, and other sectors impacted by expropriation are petrochemicals, oil services, cement, telecommunications, steel, media and food,” EDC added. The type of economic policy that Shaheen Sehbai is promoting can be considered like alcohol – In the very short term, it makes you feel good, but in the long term it destroys your health. We should be looking not at Venezuela but at the economy of Indonesia which is another Muslim country with a large mining sector in copper and gold. By following the opposite model of Venezuela and demonstrating that it is a safe place for investment, Indonesia has been able to increase foreign investment by 32 percent. The BKPM on Sunday announced investment figures from foreign and domestic investors. Foreign and domestic investment came to Rp 149.8 trillion this year through September. Among notable recipients of foreign funding were the real estate, industrial estate and office- building sector, with $800 million. It was followed by mining ($700 million; 88 projects); transportation, storage and telecommunications ($600 million); foodstuffs ($400 million); and plantations ($300 million). Shaheen Sehbai and others who are opposing the foreign investment in Reko Diq are doing more than simply promoting backwards economic policies – they are failing to take advantage of an important opportunity to redefine Pakistan’s role in the world as a positive instead of a negative. Opening Pakistan to more foreign investment is not ‘giving away’ the nation’s wealth. Certainly contracts should be determined in a way that is open and transparent and without corruption. But we are not selling the resources of gold and copper, we are working with international partners who can provide the expertise and resources to be able to transform these resources from dirt to jobs to economic growth. And just as policies of isolation feed on each other and can quickly cut off a country from others, policies of openness help change the perception of a country from ‘failing’ to ‘miracle’. 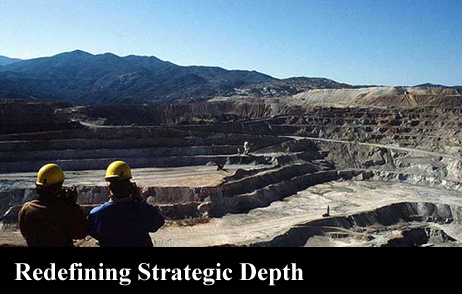 The Reko Diq mine is one example only. We are situated in a place that makes us strategic for regional security, but also for more positive reasons like natural resources and trade routes. It’s time to stop defining ourselves with negatives that bring short-term agreements and start showing the world the many positive ways that we can be partners in long-term ways. Once we make this shift, our strategic depth will be economic and it will be global. And only then we will truly be secure. This entry was posted in Blogs and tagged economics, Hugo Chavez, india, Indonesia, mining, obama, Reko Diq, Shaheen Sehbai, strategic depth, Venezuela by Mahmood Adeel. Bookmark the permalink. be 70 percent for Pakistan and 30 percent for others. Khalid bhai I think you are forgetting one thing. Yes, gold is gold and the outsider should not take 75 percent just because they are outsiders. But we must take into consideration that they will be taking a great investment of their own in the form of equipment and paying people and they also take a risk of attacks also. If 30 percent of the equity does not even cover the costs of developing the field and does not provide enough incentive why would anyone take that risk? I’m not saying that the numbers people are presently talking about are fair – but I’m saying that the idea that it would be better for us to get 30 percent than zero. And actually, it will be more than 30 percent to the economy because it will result in expanded investment in other areas. You are thinking about this like a sale of gold in the market, when it is more like a mango farm. Someone has to cultivate the land, grow the mango, harvest the mango, take the mango to market. Should the workers only get 30 percent of this and the landowner get 70 percent? Who would agree to that arrangement? That sounds like feudalism to me.